Naoki: Hello, everyone. My name is Sato Naoki, and I am in charge of the marathon. This year, due to roadwork, the path for the second half of the race has changed. Participant A: Could you tell us how to get from Sakurayama Park to the goal? Naoki: After you run through sakurayama Park, you'll see a police box on your left. Turn there and run toward the town office. Keep going until you reach the field at the junior high school. Participant B: What about water? 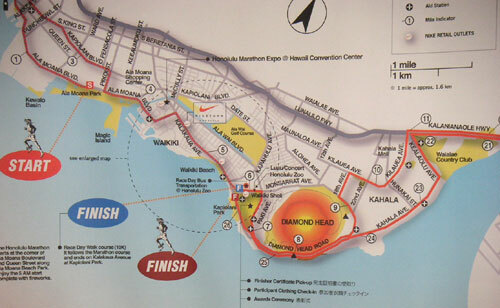 Naoki: There is an aid station with water every two to three kilometers on the course. Please run safely, and avoid injury and accidents. Hello, everyone. My name is Sato Naoki, and I am in charge of the marathon. This year, due to roadwork, the path for the second half of the race has changed. After you run through sakurayama Park, you'll see a police box on your left. Turn there and run toward the town office. Keep going until you reach the field at the junior high school. There is an aid station with water every two to three kilometers on the course. Please run safely, and avoid injury and accidents. Walk along the street for a while, and you'll see it on your right. Go along the path, and you'll see a bird's nest on your right.